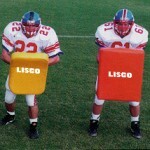 All LISCO blocking dummies are manufactured using 18 oz coated vinyl and high density polyurethane foam. Removable double layer bottoms make it easy to replace worn out bottom sections as needed. Handles are double reinforced. Available in either square or round bodies. 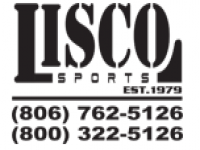 All LISCO blocking shields are manufactured with 5″ or 4″ high density polyurethane foam covered with 18 oz. 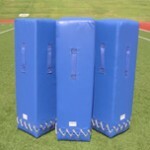 coated vinyl with two double secure straps on back for durability. Available in square or rounded corners. Recover and recondition services available for all brands. Most school colors available.